Sometime last year, the cats started poking at something in the kitchen. I asked my hubby what they had and he said "A scorpion". I about flipped my lid. I grabbed the cats and he got the job of dealing with the scorpion. Unfortunately, nowhere in there did I have a chance to grab my camera and no one believed me when I said there had been a scorpion in my kitchen! It had been pretty good sized, about 3" long, so when the hubby was so calm about it, and everyone else insisted they weren't indigenous to the area, I began to half wonder if my husband was pulling some sort of prank. Tonight I came home from work and began my usual routine--pet the cats, raid the pantry. Except when I opened the pantry, I noticed something rather large for a bug moving on the floor. This time I DID manage to grab my camera and took pictures with one hand while holding back Jack The Fierce Hunter with the other. As I was doing this the hubby arrived home, thus ensuring that he once again got to deal with the scorpion while I corralled cats. This one was much smaller, about 1.5 inches long, so not quite as impressive as the last one. But at least I got pictures! 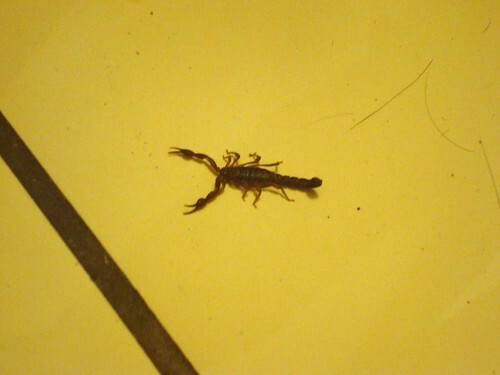 I didn't realize you guys had scorpions down there as well! How crazy and scary. YOU LIVE DOWN THE ROAD FROM ME. THIS IS NOT RIGHT. I AM NOT OKAY WITH THIS. I CAN NOT STOP SHOUTING OH MY GOD WE ARE ALL GOING TO DIE. Seriously, though. I'm totally freaked out now. Zoot--It may be because we back up to a wooded lot? Are you sure you didn't bring scorpions with you from California? I didn't sign up for so many spiders when I moved here, much less scorpions. Scorpions are fairly common on the mountains or close to them. I believe it is the rocky terrain gives them shelter in the winter. I used to find them all the time when I lived at the base of a mountain in Lacey Springs. Acme--Huh, learn something new every day. We aren't that far from Lacey Springs, so that certainly makes sense.